Apple’s just concluded the main part of its big reveal for the next-gen iPhone OS software, and it’s chock-full of new features that’ll turn the iPhone and iPad into faster, cleverer beasts. We’ve summed up the big seven changes for you. 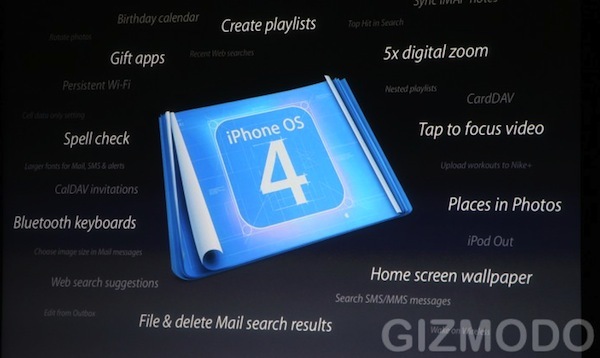 The multiple home screens that the iPhone’s existing UI uses are a sleek and speedy way to access your apps. As more users downloaded more apps, Apple added panels to this screen and even the ability to search among them by keyword to find an app. But this was clearly an interim solution. 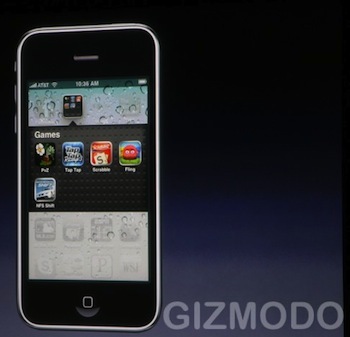 In the iPhone OS 4 software, there’s the new ability to add folders to the home screen–each populated with a simple drag-and-drop UI (as you might expect). Newly created folders get auto-names, but you can edit them, and they can also be plopped into the task bar. A most welcome feature for many, Apple’s effectively transformed how users can group together similar apps–imagine one folder for “work” items, one for “photography,” and you see what we mean. Apple’s iPhone mail app is okay, but no competitor for the iPad’s version. The iPhone’s one just got a boost: It’ll now be unified, so your mail from systems like Yahoo and Exchange will appear alongside your Apple (or other) mail feeds. You can also organize mail by thread (like Gmail), and open attachments. Multiple Exchange accounts can also be used, which will be great news to keen iPhone business users. The iPhone hasn’t quite caught up to the business market penetration of RIM’s formidable BlackBerry, but the newly tweaked Mail app goes a long way toward catching up. And Apple’s also pushing other features to get the iPhone used in enterprise more: There’s improved email encryption, the SDK hooks for developers to enable encryption inside all apps (to protect your sensitive company data, for example), and wireless app distribution so that sysadmins can fire off new apps to multiple business users automatically. Aware that games are by far and away the most numerous type of app in the App Store, Apple’s making the system even cleverer by embedding an OS-level social networking angle. There’ll be things like automatic matchmaking (to find gamers with similar skills to you) and so on–no doubt this’ll make some makers of social gaming apps annoyed, but it does make gaming on the iPhone almost as smart as some aspects of Xbox Live. 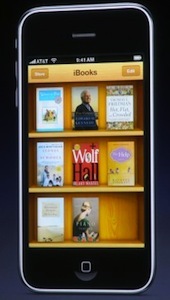 This is, from Apple’s point of view, the biggest change. It’s an OS-integrated advertising system that’ll enable developers to earn money from their products without having to pay for the services of a third-party ad management company. Its cleverest feature is that it runs inside apps, to maintain customer engagement (so you don’t have to worry about “losing” what you were doing because you clicked an ad) and it’s heavy on the rich-experience technology–this places it in competition to the system Yahoo just announced. Developers get an “industry standard” 60% share of the ad revenues. And there you have them, the seven “tent poles,” as Steve called them, of Apple’s upcoming iPhone software (it’d be one weird tent, we know). You can see a replay of the whole presentation in this video. The new firmware will hit consumer’s iPhone 2010’s, iPhone 3GS’s, and late-model iPod Touches in the “summer.” It won’t work on older iPhones in quite the same way, as the older hardware’s not powerful enough to multitask, for example. The iPad gets iPhone 4.0 OS in the fall, presumably because there’s more complex coding to be completed to get all this new stuff working on the larger device.